First of all, congratulations to Than Komianos, the Flash User Group raffle winner, who won a copy of Production Premium worth $2,100. 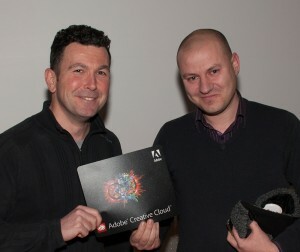 And a huge thank you to our speaker, John Cole, Digital Media Manager for Adobe, Northern Europe. In the nostalgic setting of the Main Lecture Theatre at Oxford Brookes University, he gave us a concise overview of Adobe’s engagement with HTML5, both in the creation of standards and in the development of tools for developers. Check out html.adobe.com for details of Adobe’s work. As an intro to HTML5, John recommended Rich Clark’s developer guide in .net magazine. 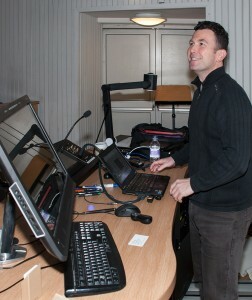 John ran through demos of CSS Regions and CSS Shaders, especially as now implemented in Chrome Canary. Take a look at CSS Shaders demos on github. For developers, we looked at the Edge tools Adobe ships with Creative Cloud – Animate and Reflow in particular detail, with a passing nod to Code, Inspect, and Muse, simply due to time constraints. You can get Edge Reflow for free right now if you’ve signed up with an Adobe ID (it’s free!). Remember the Olympics App from the BBC, or the new BBC Sport App? They were both developed using Adobe Edge. Nice. If you were there, thanks for coming, and see you next month for our meeting back at the regular venue, Film Oxford, on Thursday 21 March, speaker as yet unconfirmed. Don’t forget to subscribe to our mailing list.